Thank you so much for writing this beautiful post. 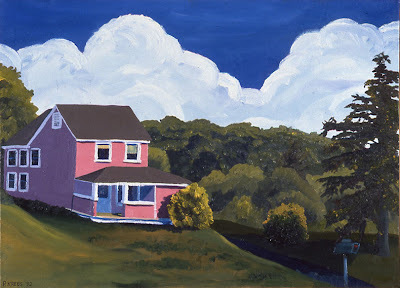 I cannot even begin to tell you how deeply touched I am to see this lovely painting of our house in all of its former pink glory. I love that you were in a Van Gogh/Hopper frame of mind when you painted it because that really comes across and I like the way it enhances the "country" aspects of our home. We bought the house in 1985 and as you so eloquently described, the neighborhood has certainly changed quite a bit since then. I wish I had seen you out there painting that picture, but we were in and out of town quite a bit in those days though so we might have been away at the time. Would you mind if I did a post about your post on my blog? I would love to include a copy of your painting and a link to your blog, with your permission of course. Definitely a beautiful post and I have enjoyed the cross references between blogs. Thank you for sharing!